Book now and avail 35% off on your blissful stay at one of the best 5 star hotels in Kodaikanal. Book your stay 3-6 days in advance and enjoy your stay at one of the best Kodaikanal hotels at 25% discount. Avail our 20% discount and plan your weekend getaway to Kodaikanal. Book now! Discover a paradise beside a lake amidst virgin hills at the only 5-star hotel in Kodaikanal – The Carlton. The Carlton is an epitome of beauty, serenity and colonial charm. 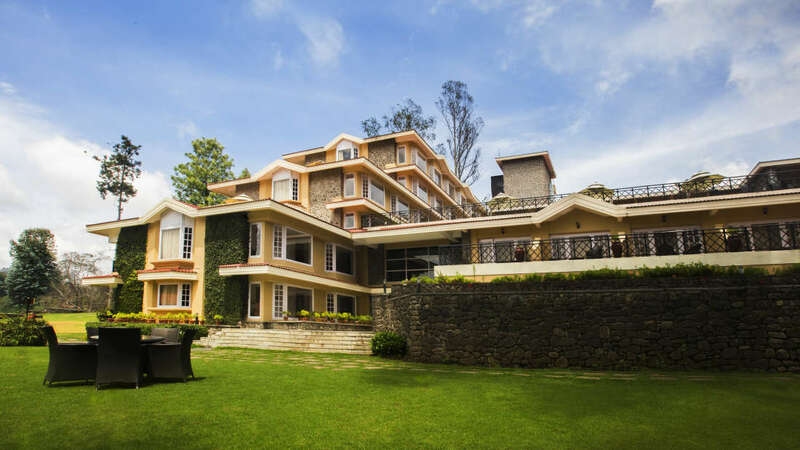 A majestic property set on the banks of the shimmering Kodai Lake, it holds the distinction of being the only 5-star resort in Kodaikanal, sprawling over acres of space. The hotel's pristine terrace gardens overlooking the glimmering expanse of the Kodai Lake enhances the pleasure of your stay by lavishing every conceivable indulgence on you and your loved ones. Spacious and luxurious accommodation is the hallmark of The Carlton with 91 stylish and comfortable rooms, including four suites and three charmingly built cottages. The Carlton offers you the best dining options in Kodaikanal to cater to every taste. Be it the fine dining at the Silver Oak Restaurant or an invigorating cup of coffee at The Hearth or a refreshing cocktail at The End of The Road bar. The Carlton Hotel near Kodaikanal Lake is a stunning 5-Star property. This splendid Kodaikanal resort attracts travellers and tourists who are looking for a luxurious stay in the city. The hotel offers impressive accommodation which includes the best cottages in Kodaikanal. A wide array of amenities and an amicable staff will ensure that all your needs are met with. An amazing coffee house along with a fine-diner and a terrace restaurant will surely take your breath away with cuisines from all around the world. Choose from various activities to spend your wonderful afternoons like cycling, trekking, horse riding, just to name a few. Host your meetings and events with utmost ease and grandeur at our splendid banquet halls. Book now to have an incredible memory of a stunning stay at the best Kodaikanal Resorts.